Rusty Pritchard is back with another Grand Lake fishing report for you. Here’s Rusty! 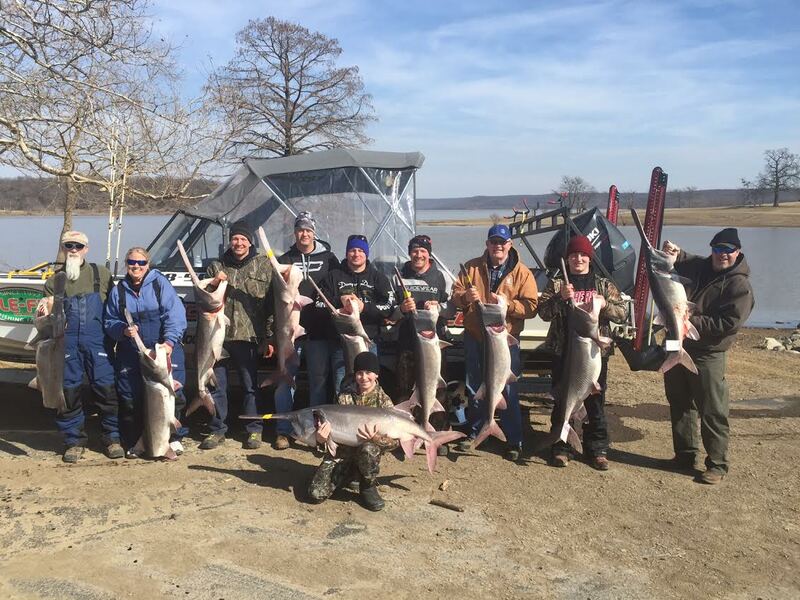 We are neck deep into spoonbill season – we’ve boated somewhere around 450 so far since December 1st with the biggest two so far have been both at 72 pounds! Whoppers!! We are still trolling deep water with 3 pounds on the main river channel drop offs. With the crazy warm weather the water temps are abnormally high. This is pushing a few spoonies up river and I think we might have an early spawn this year. I’ve heard some really good reports of white bass and crappie being caught up spring river right now! I also heard you might have to fight your way up there with all the boats on these warm weekends!! Catfish should start their spring shallow pattern very soon. Look for the blues up in flats 2′ deep especially if there is wind blowing into a bank or point. Should really be heating up in the next few weeks!